Here is an aquamarine ring that is designed and configured to compromise on nothing. You can order the aquamarine diamond ring in gold or 925 silver and rest assured that, the quality standards would remain the same. Aquamarine is the blue variety of beryl, when the mineral (beryl) is green it is referred to as emerald, pink beryl is morganite and red beryl is bixbite. Lesser known gem quality beryl colors are yellow (heliodor) and white (goshenite). Wearing an aquamarine says a lot about your style and refined taste, the gem has a pastel blue color and is never loud or showy. 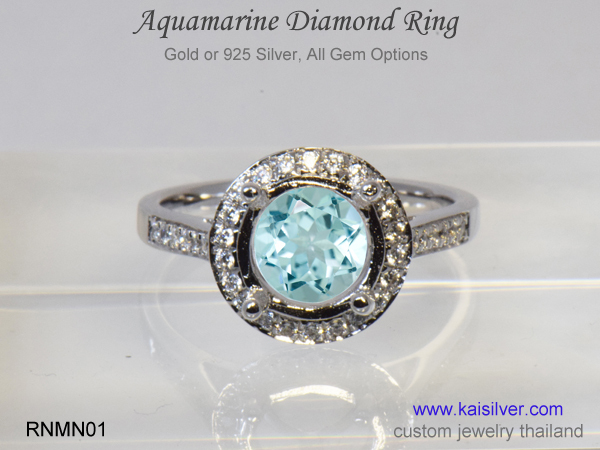 The RNMN01 aquamarine diamond ring from Kaisilver does not try to please everyone, it symbolizes quality and does not try to impress a mass market. Gem experts carefully assort hundreds of rough aquamarine pieces, skilled gem artisans meticulously cut the 7mm round gem to perfectly fit the finely crafted gold and 925 silver rings. Each gem comes with a certificate of authenticity, an independent gem testing lab does the actual gem inspection. While we are confident about the integrity and ability of our quality gemstone team, we wish to ensure that you have a clear certificate of gem authenticity. Four sturdy prongs securely hold the round gemstone in the aquamarine ring. Jewelry craftsmen work on each piece and we do not deploy any mass production technics. Each prong is given a rounded edge to ensure that, it does not scratch or hurt delicate skin. Thin prongs can save metal weight but, they are more prone to getting caught in fabric and opening up. The gold or 925 silver aquamarine ring has the same quality standards. The gold ring is available in 14k or 18k gold, choose white, yellow or rose gold. 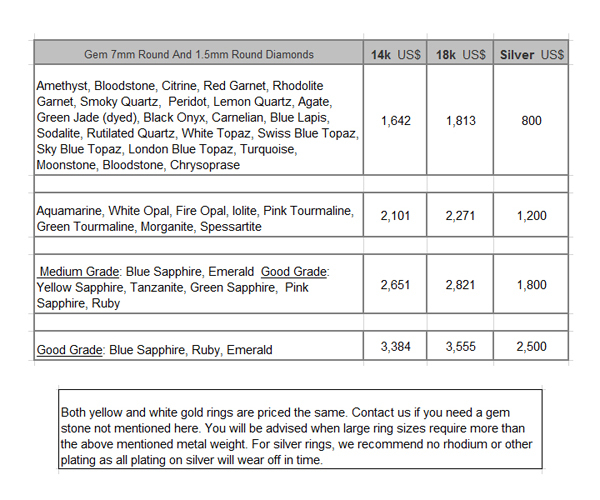 Request for a price quote if you prefer a 10k white, yellow or pink gold ring. The center gemstone is a 7mm round aquamarine gemstone. A gem authentication certificate for the gem is available on request. Round 1.5mm diamonds are provided in the gold or silver ring. The approximate diamond weight is 0.30 to 0.32 carats. A diamond quality of VS2 and G-H is maintained for the diamonds. The 7mm gem will have around 14 to 16 diamonds around it. There are 6 diamonds on both sides of the ring. The ring is sturdy with a metal weight of around 10 to 12 grams. Each aquamarine and diamond ring is custom made. Requests for all ring sizes can be accommodated. When you compare the price tags between various aquamarine diamond rings, make sure that each element of the ring is compared and evaluated. Most jewelers use fairly low grade diamonds for such rings, this helps them maintain ‘attractive’ price levels. You will be surprised to note that, most gemstone and diamond rings are advertised and sold without any reference to the quality of the diamonds. We can clearly tell you that, the RNMN01 in gold or 925 silver has a diamond weight of around 0.30 to 0.32 carats. The clarity rating of the diamonds is VS2 and the color rating is H-J. And if you wish to have an even better diamond quality for your aquamarine ring, communicate with our team of experts and they will work details with you. In our opinion, this diamond quality is perfect for the 1.5mm diamond size, you can however choose to spend more if you still desire to push for diamonds of a higher quality. At first thought the 10 to 12 gram metal weight that we have assigned to this aquamarine ring might seem like just too much but, wait till you hear our logic. Our design team has ensured that, the possibility of the ring bending or deforming with normal usage is close to nil. Low weight would also not support the sturdy prongs that we have provided for the round aquamarine gem in the center. It is quite normal for jewelry lovers to develop a close bond with the jewels that they wear, a durable and long lasting jewel will give you years and decades of satisfaction. Without much fuss and caution, you could easily pass this ring down to the next generation as a heirloom jewel. How To Buy: If you appreciate true quality for the gems and jewelry that you wear, the RNMN01 is bound to please you. 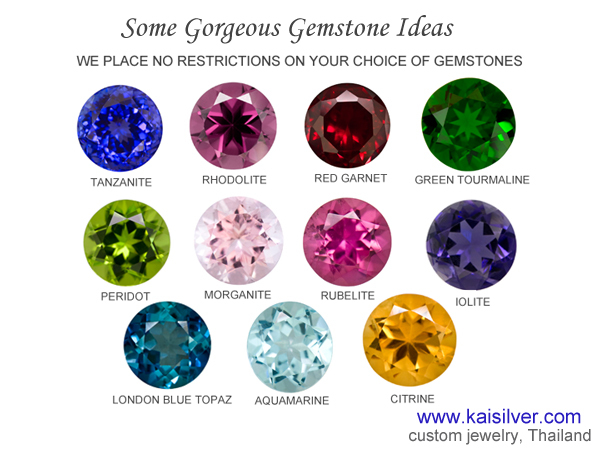 Add to this the fact that, you can choose just about any gemstone that you wish to, do not be limited by what you read or see on our website. This is a superior jewel and we do not wish to put a ‘quick click and buy’ feature to sell you the ring, we urge you to discuss your requirements with our expert team. 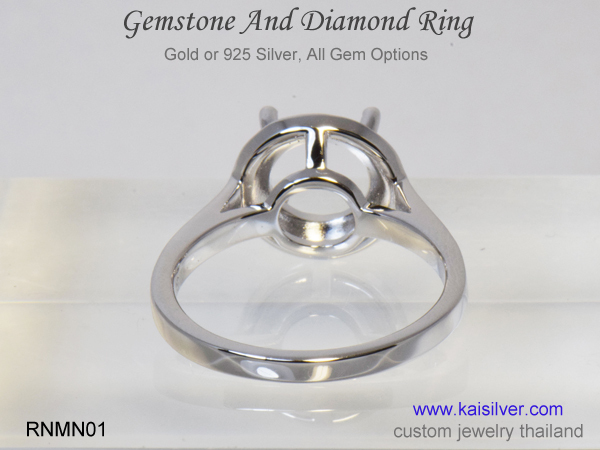 Contact us at sales@kaisilver.com and we will be grade to advise and suggest, the best solution for your requirement. Don’t forget that we can even make a ring based on your design concept. You can pay for your gemstone and diamond ring using Paypal or Western Union but, we recommend Paypal for first time buyers. Let us know which mode of payment you prefer and we will provide details for the same. There is a 4 to 6 week production time from the date of order confirmation and receipt of payment. Shipping is done through FEDEX with web tracking, you will receive the tracking number the moment the item ships. 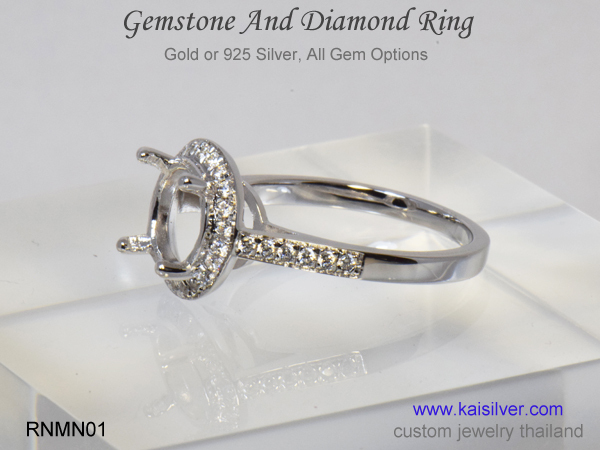 About Kaisilver: Widely accepted as the leading online provider for high end custom made jewelry, we can craft all types of jewels in gold or 925 silver. You could even send us your own design images and sketches to be custom made. Our craftsmen and gem artisans come are highly skilled and dedicated, we do not utilize mass production technics to make our jewelry. Being connected to virtually every gem mining center on the globe means that, you get an unlimited choice of gemstones. We also have preferential access to over 200 million carats of cut and polished gemstones. With over 7,000 satisfied buyers spread across 17 nations, we resort to no advertising gimmicks and rely completely on satisfied buyers to stay in business and grow. 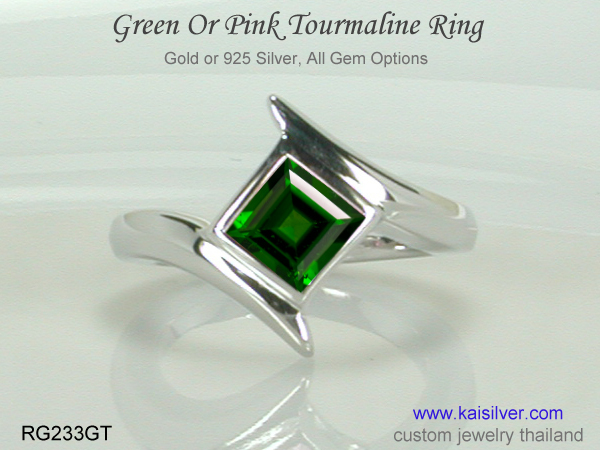 Kai Silver experts at sales@kaisilver.com will be glad to assist you with any queries that you might have related to gems and jewelry. A handpicked collection of superior gold and silver rings with gemstones of your choice. No restrictions on design, dimensions or gems. The same quality standards for gold and silver ... here. 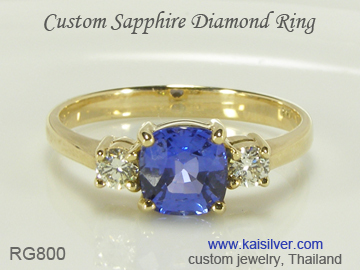 This custom made gold or 925 silver ring can be crafted with aquamarine or any other gemstone of your choice. You can also choose white, yellow or rose gold in 14k or 18k gold, more details ... here.